I am a fan of the YA Mystery genre, and I am so glad to see it really expanding lately. 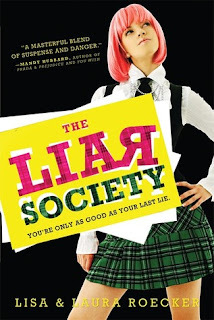 The Liar Society is a fine example of an awesome YA Mystery book, one you'll definitely enjoy! I loved the story! Plots with secret societies and people playing detective trying to uncover them, are totally my thing. Even though we didn't get to see a whole lot of the societies and their members in action, we got to learn about them, their existence and their present rivalry. Latin, crests, secret passages, along with excellent writing, all added to the mystical atmosphere that surrounded Kate's quest to unravel the truth. Speaking of Kate, what an amazing female protagonist she was! A Nance Drew in the making, Kate was all about wanting to solve the mystery of her friend's death. She stuck to her goal until the very end, never wavering. That doesn't mean she was all business and no fun, of course, quite the contrary. She's starting to have feelings for a guy from school, Liam, who, much to my surprise, is simply a good guy, no drama whatsoever, but despite the fact that Kate's feelings keep growing throughout the book, she never acts like a clingy, obsessive little schoolgirl. She holds her own every time and it was like hearing her saying "OK, there is a time and a place for this to happen. Right now I have to focus on investigating my best friend's murder." Other characters were not so much developed as Kate, unfortunately. I would like to see more of Cameron, for example, or Taylor. Maybe we'll get a chance in the next book, who knows? Also, I might just be the only one who saw the ending coming, although it's not the book's fault. I am extremely suspicious about everything and everyone when it comes to mystery books, so I had pretty much thought of every possible scenario about what will happen in the end. Overall, fans of Pretty Little Liars and Private like moi, will surely love this book! Great review! Looks like an interesting book. And btw, absolutely stunning blog design :) Love it! I compared Kate to Nancy Drew too! Haha. ANd I agree...a little more development of the minor characters would have been nice as well. But overall, I think we'd both agree that it was a good debut!